I've been perusing this message board for a few days now and have some questions. I'll start with a little history first. I'm 32 and just started running a few years ago (with a break in between for pregnancy). This spring I started training for a 10k and my knees started to hurt. It took till the summer to recognize that I was having pain from my IT band. I finally decided to take a break from running the beginning of October. Problem was that my right hip started to worsen. I decided to go see a chiropractor. 4 visits and a few days later I had a major problem with my right knee. I couldn't flex it past about 90 degrees and it hurt really bad. This lasted 24 hours and I decided it was time to see the orthopedist. While waiting for my appt I did some internet sleuthing and started wondering if it was my plica or meniscus. The continuing pain is medial and it burns (mostly my right knee, but a little in my left). I saw the ortho last Friday and that is where I found out about the femoral anteversion and my patellas tilt laterally when flexed (I'm guessing that is the result of tibial torsion?). When I stand my patellas squint with my feet pointing straight ahead. The ortho is having me get new orthotics (I currently have some for an accessory navicular in my left foot that I hate). I also have to see a PT for the IT band pain. The ortho is going to have me get an MRI on my right knee to rule out a meniscal tear. I'll see him again after the MRI. 1. Am I going to be able to run again with this kind of diagnosis? 2. Does PT and othortics help miserable malalignment? 3. At what point do you get the osteotomies? 4. What questions should I ask the ortho next time I see him? Please help me to know I'm not alone! I'm so frustrated and want to be able to run, but I also am tired of hurting. Driving is so painful and sometimes when I go upstairs it feels like something is tearing. Ibuprofen and naproxen don't help. About the best thing I've found is wrapping it in an ace bandage. Hi malgirl! Welcome to the board. You have come to the right place for support from people who understand what you are going through. For some reason your picture didn't come up......but that's okay, i'll see if I can help answer some of your questions. I am 20 and had femoral anteversion of 67 degrees. 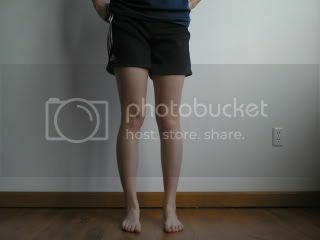 Notice I said had, I had both my femurs derotated, the left last January, and the right not last may, but the may before. I don't know how bad your knees bother you, but mine were really causing me alot of pain, I notice you mention driving and stairs. Those are two things that really bothered me as well. I have a manual car, so it was really bad. I'm not sure exactly why, but driving really got to me. I definitely couldn't run....that's good that you were able to run, I never could, even as a kid I never really ran. I liked to say I rode horses so the horse ran for me. As for your questions, I have no idea about the running, because I never could, and I still have the plates in my hips. The right plate doesn't hurt at all, but the left really bothers me. Maybe in a couple months i'll be able to give you a better answer, i'm getting my plates taken out in 10 days. Fraudninja on the board may be able to answer this, because she has some rotation issues, i think, and she runs. I think that depends on your condition, your degrees of rotation, your pain tolerance, and a whole lot of other things.....Do you know how many degrees you are rotated? That's a really good place to start... I know for me, the surgery was the best possible route to take, and it was worth the risk.... It was a big surgery, and it took me a while to recover, i'm still not totally at 100%, but I hope to be after I get the plates taken out. It has been about a 3 year ordeal, that has set me back some in college. It hasn't been, however, totally awful though. It's just a bit of a setback. I figure though, I will live the rest of my life so much better, that these couple years will just be a small amount of time. It's definitely something to talk to your surgeon about. Another thing is, I wouldn't let just any OS derotate my femurs. It isn't done a whole lot, so you may have to travel to find a good OS.... I know I absolutely love mine, and he's in MI and i'm in PA.
Next time, i'd ask him if you don't know, what the degrees of rotation are on your femurs, and your tibias. I'd also ask him if he's dealt with this kind of thing before.... most of the OS's I saw near me, knew it was Miserable malalignment, but didn't know how to treat it, or had never done the surgery. Thanks Lyndsey! I'll definitely ask about the degree of rotation and his experience. While I was looking stuff up today I came across the name of the guy that "coined" it miserable malalignment and he is right here in OR. Down in Eugene, but I could handle driving that far for an expert. We'll see how my ortho answers the questions. I'm guessing my alignment isn't as bad as yours. I hope all goes well once you get your plates out. Thanks again! No problem! Yea, your legs do look twisted....be sure to let us know the degrees when you find out! It's always interesting to compare... That's good that you have someone nearby. I have a really good written source about miserable malalignment from my OS, who is one of the leading experts on rotational malalignment, and if you want I could send it to your email. Just let me know your address. It's definitely a great read. 1.) It is possible to run again with miserable malalignment. I did have TTT's and MPFL recons to address my patella issues, but for the time being my knees are behaving and I see no need to consider a femoral osteotomy. 2.) Both PT and Orthotics can help with miserable malalignment. The Orthotics can help with the way you stand which can help with the entire leg. PT can help strengthen the leg muscles, particularly in the hips, which can significantly help with the leg. Your hip muscles play a large role in helping to keep the leg from turning inward. Just how much probably depends on your particular situation. 3.) In my opinion it becomes worth considering surgery when the benefits outweigh the risks. If you are mostly pain free and can function pretty good, then I would not consider surgery worth it. If I became unable to run because of my knees, I would not consider the risk of an osteotomy worth it...besides the fact that I am not sure how much my leg would hold up to running after such a massive surgery. 4.) I think the first step is determining how rotated your bones are. Then I would recommend consulting with an OS who is an expert in this condition. It is very reassuring to know you can still run, I think that is the thing I am most concerned about. I have my MRI tomorrow morning and my first PT. It will be good to see what the PT has to say. What led you to get the TTT and MPFL reconstruction? I had TTT's on both of my knees to deal with patella malalignment. These TTT's only addressed the need to move my tibial tubercle to a more medial position. Both of these TTT's failed and I was left in worse shape than before the surgery. The OS who did those surgeries did everything he was supposed to, it was just that I had other issues that effected the outcome. After my original TTT's I went to a Patella Femoral Specialist who was able to diagnose the femoral anterversion and patella alta. My MPFL's were torn due to multiple full dislocations, but that was not really the biggest issue. My decision to have TTT revisions and MPFL recons came at the recommendation of my OS. He is a Patella Specialist and this was the decision he reached after examining my knees, looking at x-rays, and looking at my CT scan results. My TTT revisions served to move my tibial tubercle to a more distal location and thus move the patella downward. The results have been great so far. I know that my twisted femurs remain a question mark out there. I really have no intention of untwisting my femurs. I am somehwta cautious when I run, but I know that the stronger my muscles are the better my legs feel. Hi malgirl, you're pictures definitely look miserable malignment. Did your OS mention anything about tibial torsion? You may want to ask about it because it doesn't just have to be anteversion alone. I too went to a patella specialist (not the same one as Lyndsey and Brianne though) who did a CT scan, x-rays with the leg bent as well as a lateral view, and standing leg length x-rays. From the scan they can learn fun things like degrees of rotation of the femur and tibia, the topography of the trochlear groove (if it is shallow, flat, etc), and the TT-TG which will tell them if your tibial tubercle is displaced laterally too much. The lateral xray reveals patella alta or baja, and the standing leg length films will show if there is a frontal malignment (knock-knees, bowed legs). These are so important for doctors to look at and be aware of. They are things you can ask your current OS about. As Lyndsey said, this is not something you want just any OS treating you for and definitely not something you want just any OS operating on. I had anteversion similar to Brianne, but my tibias are (or at least one is) externally rotated to 45 degrees, which is like 20 degrees too much. My patellae don't really squint though, at least not like yours and lyndsey's. My malrotation is very subtle to the eye. I decided to have femoral and tibial osteotomy (at the same time) on my left leg because I've been dealing with knee problems since 4th grade and recently my kneecap started just going out while walking. If it was just a matter of pain, I think I would have probably opted to alter my activity level and deal with it until the pain disrupted the basics of living. But the instability is what compelled me to have the surgery. My kneecap would randomly pop out multiple times a day just walking, despite bracing, orthotics, and physical therapy. I was lierally limping through life. I recently married and am ready to start a family, but know I don't feel comfortable carrying children with my kneecap popping out. I handle expensive stuff at work and would worry every time I picked up something if this would be the time it would come out and I drop a million dollar item. I ended up traveling to see my OS and that is when I learned of the alignment issues. That visit kept from making what I now believe was a big mistake which was to have a Fulkerson TTT and lateral release. I can't stress enough the importance of seeing a specialist to have these problems evaluated. I'm 7 weeks out from my surgery, so still not walking so I don't know if my surgery was successful or not, but I do know that I was to the point where I needed and wanted to do something and I believe I picked the procedure that made the most sense to do. Wow, thank you Crankerchick! You gave me a lot to think about. I decided not to bug my OS about it too much at my last visit. I'm doing PT right now and can't say it is really helping. I'm supposed to give it two months and then we were going to talk surgery. If it does come to that point I will switch doctors. I got the sense from the last visit that he's not fully up to speed on MM. It sounds like you all recommend against TTTs and that lateral releases have been helpful in some cases but not all. I haven't ever had problems with my knee cap popping out so I'm hopeful that is an indication that I'm not too far gone. I get my orthotics next week so I am excited to see how those help.